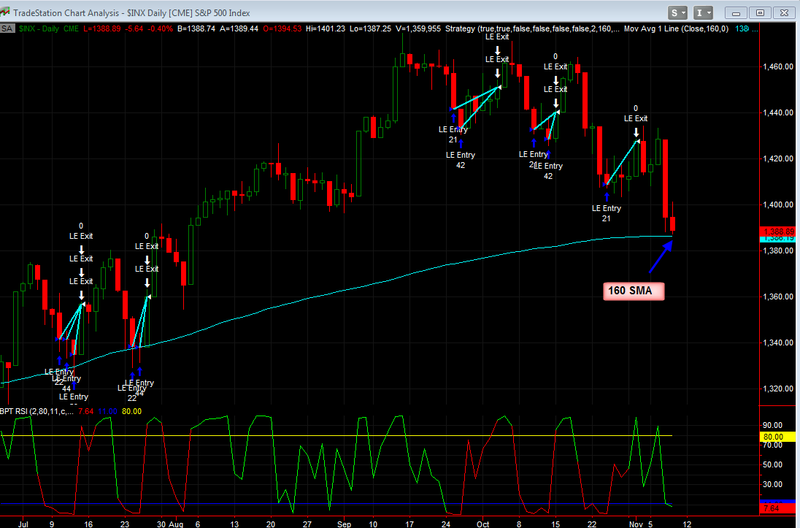 The RSI 2 BPT system will go long today if the SPX closes down but remains over the long term 160 SMA. Below the 160 SMA the system doesn't take longs. This system scales in for a potential of 4 entries of 30%, 30%, 20%, 20%, today's entry would be 30% if it occurs. System scales in 4 potential entries of 30%, 30%, 20%, 20%, but each successive entry must be at a better price than the previous one i.e. entry 2 has to be better than entry 1, entry 3 has to be better than entry 2 etc. Rules: The same as the non trending system, except this system will attempt to hold trades longer at certain times - however this is still a reversion to the mean system, it's only in the market 19% of the time, the rest of the time is in cash - while the non trending system above is in the market only 12.36% of the time.